There's a new King of the Concrete Jungle, and it's safer, more reliable and more intuitive than its previous generation. Introducing the 2018 Volkswagen Tiguan. With the 2018 Tiguan, you'll stand out from the crowd in eye-pooping color, as you enjoy modern conveniences that'll elevate your drives around every bend. 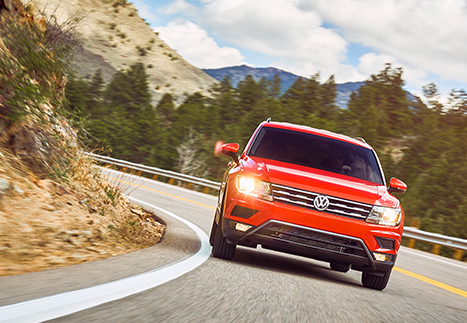 This family-friendly and incredibly sporty SUV is the perfect companion for any errand or weekend adventure, so hurry into our Volkswagen dealership near Fishers, IN, today to get behind its wheel and experience it for yourself! If the 2018 Volkswagen Tiguan sounds like the perfect new SUV for you, head into Tom Wood Volkswagen to take it for a test-drive! Check out these videos and see just how exciting and high-tech the 2018 Volkswagen Tiguan is, then experience it for yourself at Tom Wood Volkswagen!